Dream Uniforms, Dubai,UAE. | Customized Uniforms for Corporate, Retail Chain Stores, Schools, Hotels etc. Dream Uniforms is specialized in customized uniforms for various sectors including Hotels, Corporate, Retail Chain Stores, Hospitals, School, Airports & Air Lines & currently catering to clients in 15 countries In Middle East, North Africa, Europe, America & Russia. Established in 1976, Dream Garments Group started Dream Uniforms as a dedicated organization dealing solely in classy and meticulously crafted uniforms spanning all forms of disciplines. Creative styles and designs carve a niche for Dream Uniforms as the pioneers of customized uniforms in the global scenario. What elevates Dream Uniforms from the industry is the cycle of events from designing to the manufacturing of uniforms being carried out in house. With a team of international designers dedicated for scrupulous customization, Dream Uniforms offers a plethora of styles and designs to choose from. Dream Uniforms is a specialist in Design Innovations & Branding standards where each design is customised to unique requirements and branding standards of our clients. Professional Designers having experience across many continents & industries help us create most innovative and inspirational design for all our sectors. 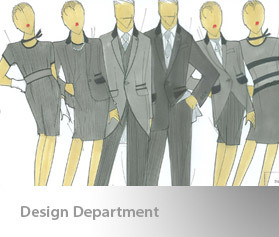 Design Impression meeting the Branding Standards of companies & employee comfort in their uniforms are two important standards our Designers keep in mind during research for each project. The design team uses the latest computer aided systems to create most innovative designs. 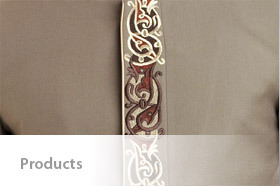 Global sourcing on all fabric /trims and accessories to meet international branding standards. Garment specifications, pattern design, markers are made using latest CGT Systems in Design Department there by balancing latest style & colors with practical and comfortable work wear. We create a stylish unique look that reinforces your brand image and makes your employees feel good, motivated and look great!